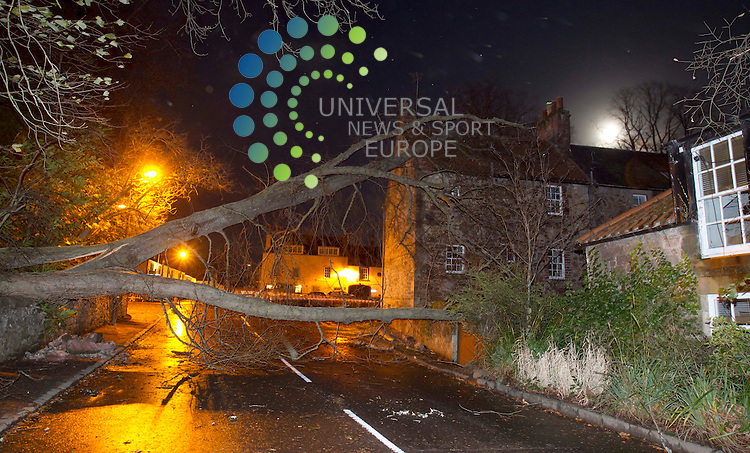 A house in the little village of Gifford near Edinburgh gets hit by a tree as major winter storm moves in over Scotland..The Met Office has issued its highest warning, a red alert..Hundreds of schools have been shut and bridge and road closures are causing disruption. 90mph winds are expected..Parts of England and Northern Ireland are also being hit by extreme wind and rain..Picture: Universal News And Sport (Scotland). 8 December 2011. www.unpixs.com.